THE STREETWALKER IS NOW A STREETWOKKER. About middle of last year, we went with Ivan Man Dy on his Malacañang Museum and San Miguel District walking tour. In the middle of a conversation with participants, he had to answer a phone call. Afterwards, he said out loud in half-exasperation that he ought to do that Binondo map he's been thinking about since people keep bugging him about where this and that restaurant is located (with the traffic and the confusing street layouts, can you really blame anyone who gets lost?). Who better than a streetwalker with a surname of Man Dy to come up with a handy guide to Binondo's nook and crannies? Personally, I thought it's about time someone come up with this. While I'm a Makati transplant for almost a decade now, I grew up in Manila and Chinatown was, is, and will always be a favorite haunt and this is a welcome treat for me. FULL SERVING OF CHOW. I wouldn't want to pre-empt Ivan but I really liked the comprehensive listing of eating places to include noodle houses; specialty restaurants (which includes my personal favorites: Po-Heng Lumpia House, Dong Bei Dumplings; Kim Hiong and my all-time favorite, Makimi at Shin Din Kha); old timers (like Panciteria Mañosa, Ambos Mundos and Panciteria Ramon Lee); fastfood; lauriat dining (including President Restaurant); dessert places; pastry shops; even vegetarian options. All are rated from cheap thrills to Taipan splurges. As Ivan says, "what is Chinatown without chow?" A SMORGASBOARD OF CULTURE. Apart from the chow list, what I also like about the map is the sprinkling of heritage info and trivia on the different streets and places from the Basilica Menor del San Lorenzo stretching all the way to Aranque Market. Like where else in the Philippines can you find a Baroque church and Chinese temple in one street? HANDY HELPER. The size is just right for my messenger bag or backpack while the map illustrations are big and bright (no need for eyeglasses or magnifiers here). 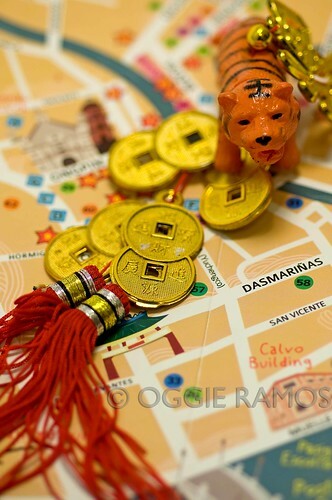 There are even traveller's tips included to make your D-I-Y Binondo trip easier and safer. DO I RECOMMEND IT? A big yes. 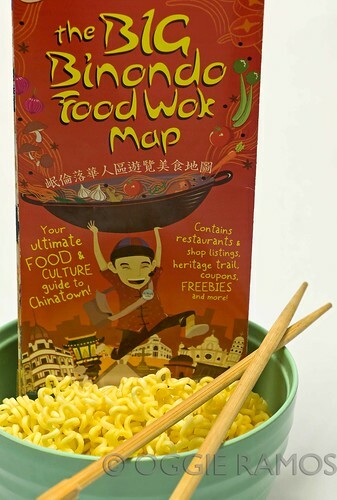 It would make a great guide (or gift) since Chinese New Year is just around the corner. And I think it's an eyeopener for a lot of people as to the many possibilities of exploring this corner of Manila on their own. Where to get one. At the risk of sounding like an infomercial, this map is not (at least not yet) available at the usual stores. To get one (or two, maybe more), email Ivan at fun@oldmanilawalks.com; call 0917-329-1622 or go to Bahay Tsinoy, Libros Filipinos Bookshop at the Filipinas Heritage Library, and La Monja Store in Intramuros. I want to be a wokker, too! that would be a great tool, thanks for the heads up. I'd like to have that map! Sandy, it's a good choice :D would love to be a wokker, too! Photo Cache, it's worth every peso you spend on it. oh dang, it's a map? i still want it! haha! 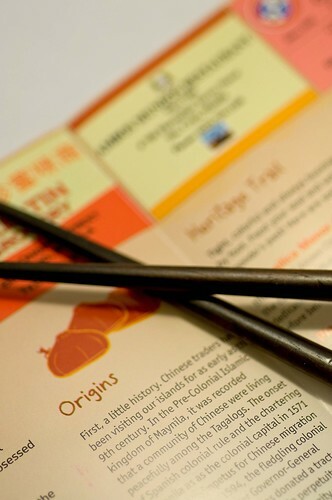 ive always wanted to try this binondo food walk! how much for one person? does it have to be in groups or i can go alone? thanks! Bridge, for the rates and sked, please get in touch with Ivan Man Dy at 0917.3291622 or email him at fun@oldmanilawalks.com. You can join the tour on your own though he assembles a group to make the experience fun and at the same time, cost-efficient on his part.